(TibetanReview.net, Oct10, 2017) – The Central Tibetan Administration (CTA) at Dharamshala, India, is to mark 2018 as ‘thank you year’ to express gratitude to “all our friends and supporters especially India” as “it will be exactly 60 years since His Holiness the Dalai Lama left Tibet for exile in India,” said the CTA on its Tibet.net website Oct 8. 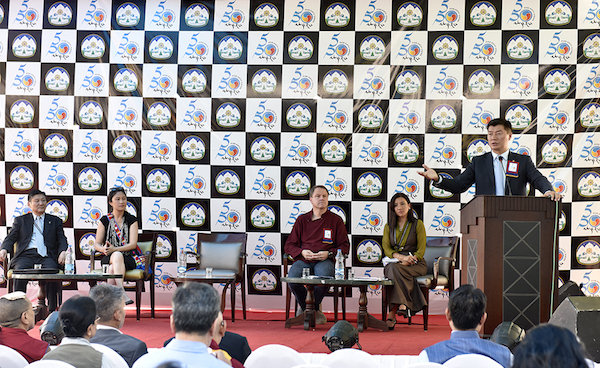 An announcement to commemorate the year was stated to have been made by President Lobsang Sangay of the CTA at the conclusion of a three-day, closed-door, international brainstorming forum held at Dharamshala. The forum was stated to have seen participation by 185 “top political strategists, politicians, communication experts, activists, bloggers and writers” from 21 countries. More than 80 of those participants were stated to be non-Tibetans, but very few have been named in Tibet.net statements on the forum. The Tibetan administration would look into all the recommendations made at the forum, which was meant to strengthen and revitalize the Tibetan movement for the next five or, as the case may be, 50 years, and try to formulate policies based on them, said the Oct 8 Tibet.net statement. The statement gave no indication of what any of those recommendations were. The participants were expected to confine their suggestions and recommendations within the precincts of the exile administration’s middle way approach of seeking autonomy, not independence, for Tibet. In this connection, Dr Sangay has said in his concluding remarks that the Tibetan administration headed by him was not against rangzen (independence) advocates per se, admitting that “rangzen is a historical fact of Tibet”. However, he was further quoted as saying, “some fringe elements criticising His Holiness the Dalai Lama on the pretext of advocating rangzen is unacceptable”. He has also indicated that the rangzen advocacy is a confrontational approach. The Dalai Lama had initiated the middle way approach as a mutually beneficial solution to the Sino-Tibetan conflict and the exile administration has rallied behind it, introducing parliamentary resolutions, distributing a stream of publicity materials, holding seminars, and launching a campaign of education workshops on it across the exile Tibetan communities over the last few decades despite lack of any positive response from China, which has, in fact, ridiculed and rejected it repeatedly. “We should keep in mind that there is no one who has done more for the Tibetan people and Tibet cause than His Holiness the Dalai Lama,” Dr Sangay has said while calling on “rangzen groups” to “make the distinction between these two things”. The Five-Fifty Forum, as a Washington Post report Oct 8 put it, sought to chart a five-year plan for pursuing a return to dialogue and negotiations with China. If that’s unachievable, the Tibetans will plan for another 50 years of resistance to China’s occupation, systematic repression and attempted cultural genocide in Tibet, it added.